Very instructive. I’ll pass it on to my friends and colleagues. Horrific. I had no idea. However… color key lines within the blog. Also, color lines that talk about colors in the maps. These make the post much easier and quicker to read and digest. i look forward to the day this conflict eases and ends. This is a fantastic assembly of maps you have gathered together. I am aware of them all, but this is really a great collection for anyone familiar with the Zionist land theft issues in the WB, to help others understand the true meaning of (this part) of the Palestinian suffering and struggle. I also really enjoyed your own informative descriptions of what the keys to the maps mean. They come from a place of actually having witnessed it. Once again, great info for the ley man to get a better understanding of true facts on the ground. I also truly envy you for being able to go and spend time with such rich wonderful people whose tie to the land is evident and REAL. I don’t know!!! This is not what i’ve been told & read all my life, but don’t want too say you’r wrong. Im going to read you’r book & the Bible & get back w/ you. I don’t believe my lying eyes? This is the difficulty of dealing with homeschooled students or those educated with whitewashed history books. Even when the person has demostrated and researched proof, they immediately believe they are being lied to, because to admit that the people they’ve trusted their entire lives had an agenda to follow has been lying to them, they would rather be viewed as idiots. Another strong message here is this: Watch what they do, not what they say. 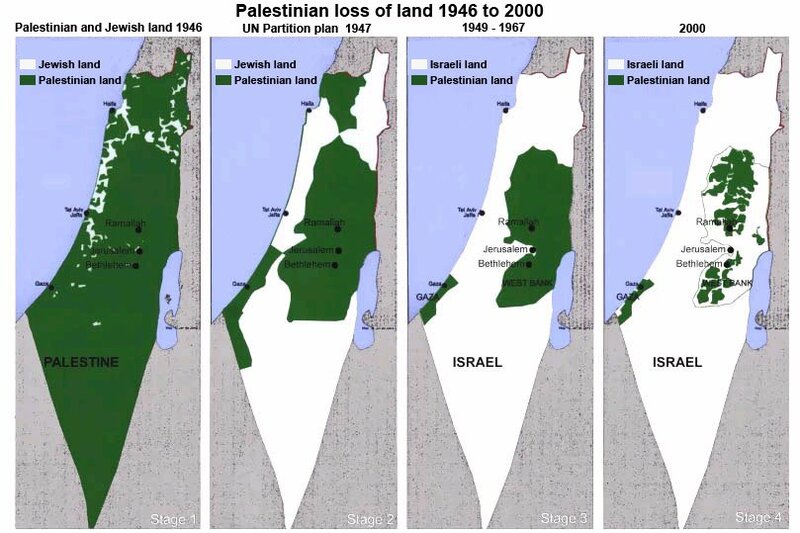 I was stunned at how obvious the land theft is when you see those four maps–of what I and others have called The Incredible Shrinking Palestine. I suppose we in the US shouldn’t be surprised–at least if we got a chance to see the continent North-South America & Canada in its pre-WhiteEuropeanInvasion days — before Columbus and his merry band of men wiped out from 8m to 15m Arawak Indigenous People. I also saw recently a YouTube clip describing the feats/exploits of [Sir] Francis Drake (much later). Turns out this British Hero was a “privateer”–aka Pirate–flying under the Skull & Bones (like the Bush family), who raped, pillaged, burned and looted on land and on sea–under the imprimatur /protection of Q. Eliz. I–and she got her cut of the spoils. Which comprised the bulk of her “budget,” the piece said. Some folks in the Cherokee Nation put together the North American map as placemats, so folks might have them to look at three times a day (for those who get three means a day). There was not one single spot on the map that was not “occupied” by one or other of the something like 1,100 separate nations. And it was also interesting to note that not only did the European Invasion take the Indians’ lives and land, they expropriated their names as well. Winnebago (I was driving another brand of RV at the time) stands out. Great page. Hope to read your book soon. 🙂 I also was wondering if you had a source for these maps. Sure. The first four maps are just general geography and not controversial, the fifth (with the dark blue spots as settlements) comes from an Israeli human rights group called B’Tselem, the Wall maps are from the PLO Negotiations Affairs Department (and I think they are based on UN and Israeli government maps), and the map of Palestinian loss of land since 1946 is based on UN data and Israeli government data about Areas A, B, and C.
I’ve never quite had someone explain what they mean by Israeli or palestine. Are we talking about a government or are we just talking about the people. “Israeli settlements” sounds like just people from Israel moving… If that’s the case… it’s just immigration.. unless palestine people hate israelis so much this is just about nto wanting them as a neighbor. It couldn’t be that it’s acctually the government controling the land. The people who live in these settlement’s…. what country to they get their passports from? Israel is a state with a government. Palestinians are a people whose land has been largely swallowed by the establishment of the state of Israel in 1948 (which was accompanied by massacres and mass ethnic cleansing of indigenous Palestinians). In 1967, Israel swallowed the last of Palestine’s land, the West Bank and Gaza. Israel militarily occupies these lands without giving Palestinians any rights of citizenship, in contravention of international law. The settlers who are transferred to the West Bank and Gaza with the support of the Israeli government are not “just moving” there. Transferring civilians to occupied lands, and especially housing them on land stolen from its Palestinian owners, is illegal according to international law. The settlers have their own special roads, bus lines, security details (paid for by the state of Israel), schools, etc., and Palestinians are not allowed to reap the benefits, but instead are shunted to secondary roads subject to checkpoints and closures. The settlers have Israeli passports and Israeli citizenship and voting rights in Israel, while the Palestinians around them have no state and no meaningful voting rights and no citizenship in Israel. They can “vote” for their Authority under occupation, but everyone knows that Israel is the one that actually controls the land — the borders, water, airspace, and every other meaningful aspect of sovereignty. And even their vote for the leaders-inside-their-prison can be overturned if Israel doesn’t like it (see: 2006). If Israelis or Jews wanted to move to Palestine as immigrants, and obey the same rules as everyone else, there would be no problem. But when they horribly oppress and disenfranchise people in order to move illegally onto someone else’s stolen property… Houston, we have a problem. Thank you very much for a good explanation to a situation, i can safely say, most of us Americans have no idea about. Great help for my History homework! Was so stuck until I found the maps! 🙂 thank you! I’m interested to know how you got involved in this debate? You are obviously biased, but hard to ignore. Thanks for your information. The photos are a real jaw-dropper. Most shocking is the extent of Jewish settlements and how they strategically block any future hope of a contiguous Palestine state–should that ever be allowed to occur. Thank you for writing this very informative and very truthful account of what is happening in Palestine and Israel. I’ve heard Benjamin Netanyahu mention several times in interviews that “Israel will not go back to pre-1967 lines.” This always made me wonder: well, then what’s left for the Palestinians? Its disgusting really. I’ve also always wondered how a group of people who have gone through hundreds of years being treated to disgusting conditions can inflict the same damage and pain on another group of people. It make no sense to me at all. Of course, there’s no doubt that many of the most powerful nations have turned a blind eye and let Israel carry on with these atrocities. I’m ashamed to admit that even my home Canada is complicit in this game. I can only pray for the freedom of Palestine. Fantastic site with maps, facts, and so on. I think I know about this situation, but then I see a site like yours, and it brings tears to my eyes. Well…as an first generation American Palestinian, I have to say that you have done well. THE TRUTH has been finally coming out about the inhumanities perpetuated on the Palestinians for over 60 years now. My inheritance of quite a bit of land is in the West Bank and I intend to collect reparations from ISRAEL AND THE UNITED STATES. You are absolutely right about the monetary support we give to Israel…it is unprecedented in the history of the United States. Americans should know that we are considered The UNITED STATES OF ISRAEL! I believe you certainly do deserve reparations but as much as I would love to see that happen I wouldn’t hold your breath. Especially waiting for reparations from Israel. to cut the story short: not until 1948 that the state of Israel was formed following the Holocaust during the 2nd world war. since then is real have been firing missiles killing innocent women n children in quest to claim territory that doesn’t belong to them. Pls if we are for the living God we should stop sponsoring n supporting the killing of souls created by God whether Jews,gentiles ,Christians, Moslems, Arabs, Indians,we re all humans for Gods sake. I need a very simple, stark graphic to represent apartheid as applied by the Israelis in conquered Palestinian territory. 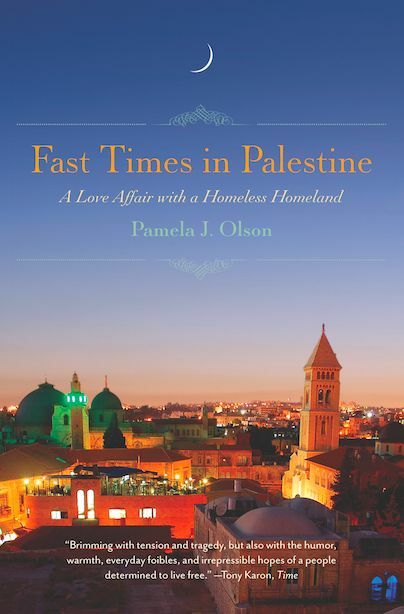 Fast times is a great read.Not being in favour of islam in general your writing has changed my outlook on palestinean people and the loss of their land.I would like to visit the area in general.suggestions appreciated..john s. from nth qld.aust..
Wow! Thank you for that breakdown!